Christiana's mother and father were never married. When Christiana was a little girl,she was living with her mother, her half-brother, David, and David's father. One evening her mother took both children, left David's father, and moved to Kasoa to marry Micheal Tetteh. Christiana's mother told her that Micheal Tetteh was her father. Her real biological father, Maxwell Boboyo, does not know about her and she still does not know about him. Patrick discovered Christiana, David and Rachael at the same time. He came across them, hanging around in Kasoa during the day and questioned why they were not in school. They explained it was because they could not pay school fees. Patrick left his number with the children and told them to have their parents call him. The next day the phone rang. He was contacted by Christiana's father, Micheal Tetteh. After explaining his mission, Patrick asked him to bring the children to the school where they could be provided with an education without the fees. Micheal did not hesitate and brought all three children to the foundation the next day. The children were extremely happy to be brought here knowing they were getting three meals a day, clothes and would get to go to school. Christiana also explained that she was scared of her father as he often beat her. Christiana has to be the biggest mother figure out of all the children at the orphanage and is mature well beyond her years. Although, despite her great maternal instinct she says she does not want to be a mother and would rather devote her time to becoming a doctor. She is extremely intelligent and always does well in school, especially in her favourite subjects English and Science. She is always the first to help with laundry and other duties but never finds them a chore. 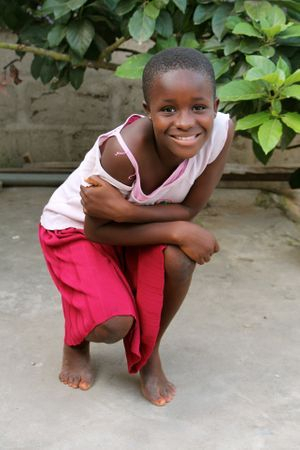 Christiana also loves to write letters and has become really good at writing her own stories. She is a young girl with many talents!